We were going to fetch the Shield before Abbey today but the final of the inter-house Fives interfered so eventually we went after Abbey between cheering mobs. When we got ‘up’ Home Boarders we found the Shield was screwed to the wall and not to be moved. Here was a pretty state of things, Bonner, who really might have troubled to see to the matter before, sent for the Carpenter and eventually we got it down, the unfortunate people in Yard shouting themselves hoarse. I suppose it really wasn’t very long but it seemed an age. It was a great moment bringing it across. 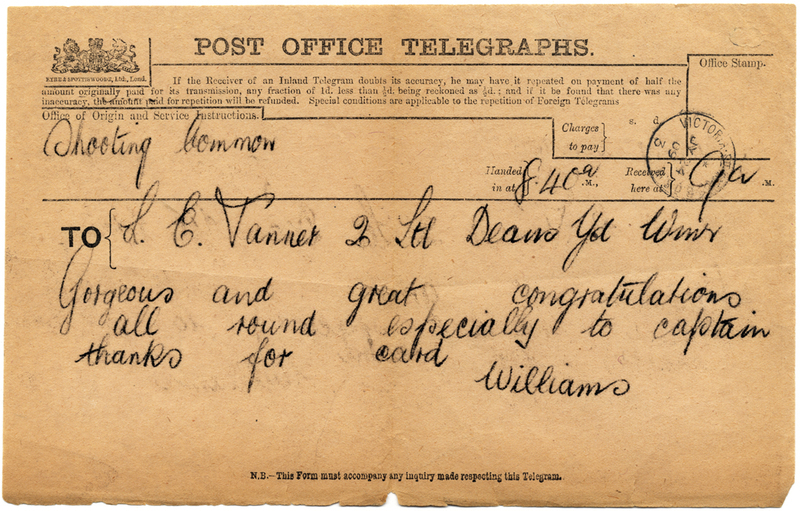 I received a congratulatory telegram from Hodder-Williams on our victory. This entry was posted in School Customs, Sport and tagged Bonner, Fives, Hodder-Williams, Home Boarders. Bookmark the permalink.